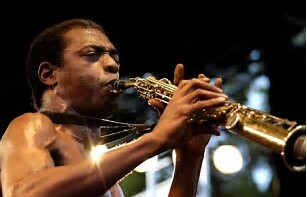 Nigerian Afrobeat virtuoso, Olufela Olufemi Anikulapo Kuti, popularly known as Femi Kuti, has broken the world record for the longest single note held on a saxophone. The celebrated musician, eldest son of afrobeat pioneer Fela Kut, and four-time Grammy Award nominee, attained the feat on Sunday at the New Africa Shrine, his sister, Yeni Anikulapo-Kuti, disclosed this on her Instagram page @yenikuti. He later formed his own band, “Positive Force’’ in the late 80s, and began establishing himself as an artist independent of his father’s massive legacy. His first record was released in 1995 by Tabu/Motown, followed four years later by Shoki Shoki (MCA), which garnered widespread critical acclaim. In 2001 he collaborated with Common, Mos Def and Jaguar Wright on Fight to Win, an effort to cross over to a mainstream audience, and started touring the United States with Jane’s Addiction. In 2004 he opened The Shrine, his club, where he recorded the live album Africa Shrine. After a 4-year absence due to personal setbacks, he re-emerged in 2008 with Day by Day and Africa for Africa in 2010, for which he received two Grammy nominations. In 2012 he was both inducted into the Headies Hall of Fame (the most prestigious music awards in Nigeria), was the opening act on the Red Hot Chili Peppers’ European arena tour and became an Ambassador for Amnesty International. He continues to expand the diversity of his artistry on his new album (2013) No Place for My Dream. Femi Kuti was a judge on Nigeria’s huge TV show Nigerian Idol Season 3.